Wroclaw (pronounced Rockslarv) is a city in Western Poland in the region of Silesia. 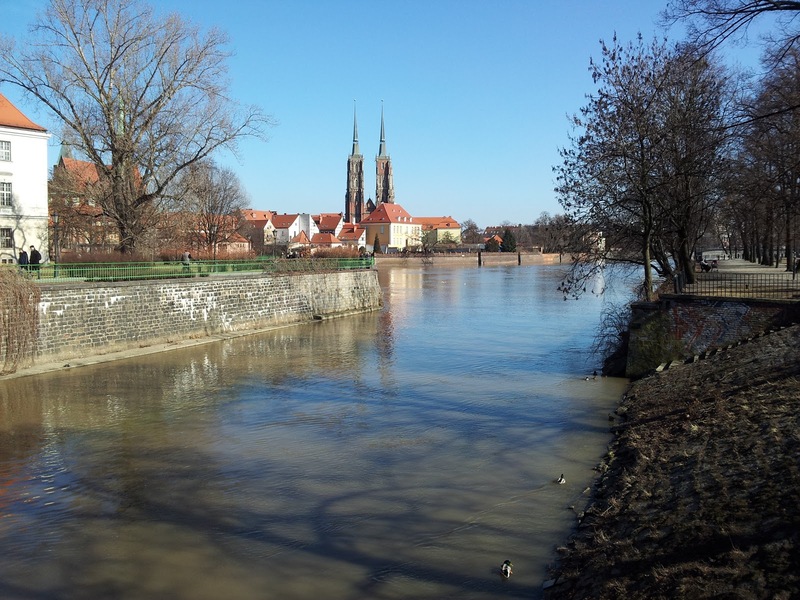 It is a city of islands situated on the Odra or Oder River and is sometimes referred to as 'The Venice of the North'. It also boasts the largest medieval market square in Europe although most of the buildings have been rebuilt after the bombings of WW2. Throughout it's history it has been part of Bohemia, Austria, Prussia, Germany and Poland. There are over 180 (at last count) dwarves or gnomes cast in bronze scattered throughout the city (I will be writing a separate blog on these little chaps). The Town Hall after the WW2 bombings. The Market Square is beautiful and looks very old but many of the buildings were levelled during the Second World War when it was occupied by the Nazis and bombed by the Russians, so, most of the buildings date from 20th century rather than the medieval period. However, it still a remarkably beautiful place full of cafes, bars and restaurants and whose hosts give an exceptionally warm welcome and serve fabulous food. This amazing building (inside and out) was founded in 1670. It's two main attractions are the ceremonial hall (Aula Leopoldina) and the mathematical tower. The university was visited by Charles Darwin and past professors included Alois Alzheimer (Alzheimer's disease) and Robert Bunsen (apparently he didn't invent it but improved the bunsen burner). We came across Tumski Bridge on our way to Ostrow Tumski, the Cathedral Island (actually, it's not an island any more as constant flooding forced the town planners to fill in part of the river in 1810). From the university area of the old city you first pass through Sand Island, also dominated by a huge church and a library, and enter Ostrow Tumski via this lovely iron bridge dating from 1889. You'll soon notice that it is covered with padlocks placed on the bridge by newlyweds who fasten the padlock and then throw the key into the river as a symbol of their unbreakable bond... how romantic! This is the oldest part of the city, the oldest surviving beam was dated as being cut down in 985 and the guidebook tells that a silver cross from the area dates back to the same period. In the Island's middle stands the Cathedral of St John the Baptist an impressive and imposing building dominating the nearby landscape. A visit to Wroclaw wouldn't be complete without a visit to the Raclawice Panorama. 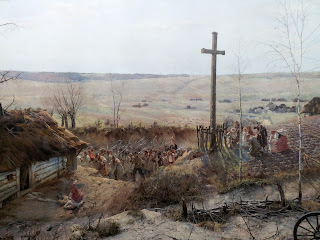 It is 140 meter long, 360 degree, painting depicting a battle scene from 1794. It is an amazing work of art and set in a rotunda enabling you to view the scene as if you were there. You get a 30 minute commentary in the form of hand held set explaining the painting and its history.